The Priest having finished the Oblation Prayer, makes the sign of the cross with the Paten and places the host on the Corporal. This form of the cross expresses the identity existing between the Sacrifice of the Mass and that of Calvary. Next, the Deacon puts Wine into the Chalice, and the Sub-Deacon approaches to fulfil his office, which consists in putting the water into this same Chalice; this act is the highest of all his functions. The prayer which accompanies this ceremony is very ancient; it dates back as far as the first ages of the Church, and indeed it is easy to see that the Latin was a spoken language at the time it was composed. In it is strongly brought before us what is the importance, what the dignity of the Water here used in the Holy Sacrifice. Why is Water put in the Chalice? 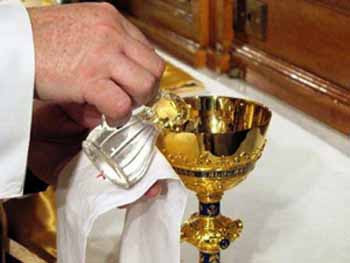 Because, according to Tradition, Our Lord Himself when instituting the Holy Eucharist, mixed Water with the Wine, as the abstemious are wont to do, and the Church continues to observe this custom. She avails herself of this opportunity to speak to us in wonderful language, unfolding to us sublimest mysteries. Thus says Mother Church: Deus, qui humanae substantiae dignitatem mirabililer condidisti. Why speak here of the dignity of man? Why recall here, the Divinity and Humanity of Jesus Christ? Because the Wine and Water here used are figures: the Wine represents Jesus Christ as God, the Water represents Him as Man. The weakness of the Water, compared with the strength of the Wine, expresses the difference which exists between the Humanity and the Divinity of Jesus Christ. We must see ourselves too in this water, since we it was, who by Mary, furnished Our Lord with the Humanity; thus does Holy Church express herself on this subject, in sentiments of admiration; thus does she love to put forward the true dignity of man. Already had the royal Prophet sung this our dignity, in his Psalm: Constituisti eum super opera manuum tuarum, omnia subjecisti sub pedibus ejus: Lord, Thou hast placed man over all the Works of Thy Hands; Thou hast put all things under his feet (Ps. viii.). And if we recollect the manner of his creation by God, we are not surprised to hear Holy Church here saying that he was created in an admirable manner. When there is question of man, God speaks this word: “Let Us make man to Our Own Image and Likeness.” And as He said, so hath He done. But if man has been thus created, he has been moreover, raised up in a still more admirable manner, after his fall, and Holy Church fails not to say so: mirabilius reformasti. Yes indeed, God has up-raised him in a manner far exceeding, in wonder, that of His creation, in espousing human nature by His Son, and so reforming fallen man. Da nobis per hujus aquae et vini mysterium, ejus divinitatis esse consortes, qui humanitatis nostrae fieri dignatus est particeps, Jesus Christus Filius tuus Dominus noster. Make us, by the mystery of this Water and of this Wine, participators of the Divinity of Him, Who hath deigned to make himself Participator of our humanity, Jesus Christ Thy Son, our Lord. Holy Church here puts before us, first of all, in bold relief, the Mystery of the Incarnation, by means of this thought of the Water and the Wine being mingled together in one potion; thus does she recall the union of the Humanity and the Divinity of Our Lord, and site asks of God that we too may participate in the Divinity of the Lord Himself, just as St. Peter expresses it, in his second Epistle: ut per haec efficiamini divinae consortes naturae, that is to say, that by the promises which were fulfilled in Jesus Christ, we may be made participators of the Divine Nature. This deification, begun on earth by sanctifying grace, will be completed in heaven in glory. In the terrestrial Paradise, the devil told Eve that if she and Adam would only follow his counsel, both of them should be as gods. Herein he lied; for then, as now, by the faithful fulfilment of the divine precepts alone, can man ever attain unto God. In Heaven, we shall be as gods, not that we shall become so, by nature, but that in the Beatific Vision, we shall see God even as He sees Himself, and our state will be that of creatures placed immediately below the Divinity. Holy Church is bent on holding this Truth before our mental gaze, and she does so in this Prayer, while speaking to us of the Incarnation of the Word, the very Principle of man’s true greatness. Let our humanity be totally subsumed in the Divinity of Our Lord Jesus Christ, just as water is totally subsumed in wine just before its transubstantiation into the Precious Blood.